A USA Judo team of visually impaired athletes is competing in Turkey this week at the IBSA World Championships and Games, demonstrating once again that judo is easily adapted for people with seeing disabilities. Some of USA Judo’s top judokas – with or without visual impairments – including Myles Porter, 100 kg (Olympic Training Center, Colorado Springs, CO), traveled to Antalya, Turkey, for the competition. This is Porter’s third world team. Coaches leading the USA Judo sqaud include Scott Moore, head instructor of Denver Judo in Denver, CO, who has medaled at many international competitions for visually impaired athletes. For a complete roster of athletes representing USA Judo, click HERE. Stay tuned for results. 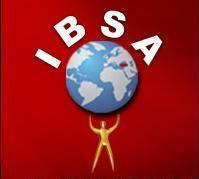 This is the Fourth IBSA World Championships and Games 2011, the flagship event of the IBSA, International Blind Sports Federation. As many as 1,300 blind and partially-sighted athletes are expected to compete through April 10 in a variety of sports, including swimming and power lifting in addition to judo and other events. For more information on the games, click HERE. This entry was posted on April 7, 2011 at 6:00 am and is filed under Judo Tournaments. You can follow any responses to this entry through the RSS 2.0 feed. You can leave a response, or trackback from your own site.